Senior .Net Developer creates web applications and desktop applications employing the DotNet platform, the common duties that are listed in the Senior DotNet Developer Resume include – producing codes using net languages; configuring, upgrading and debugging current systems, providing technical support for web, mobile and desktop applications; participating in requirement analysis, producing software design and architecture using net platform, writing clean, scalable code; testing and deploying systems and applications, improving existing software, developing documentation all through the SDLC process, providing technical assistance to various other software and net developers. 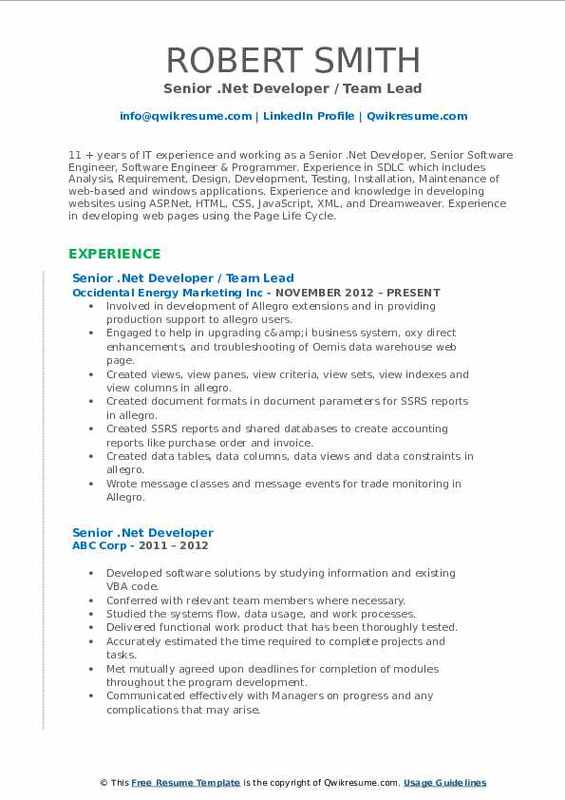 Successful Candidates seeking this line of operation should demonstrate the following attributes – knowledge of coding, a sound understanding of MS Net technologies, familiarity with ASP and .net frameworks and architectural styles, a sound grip of agile methodologies and excellent troubleshooting skills. 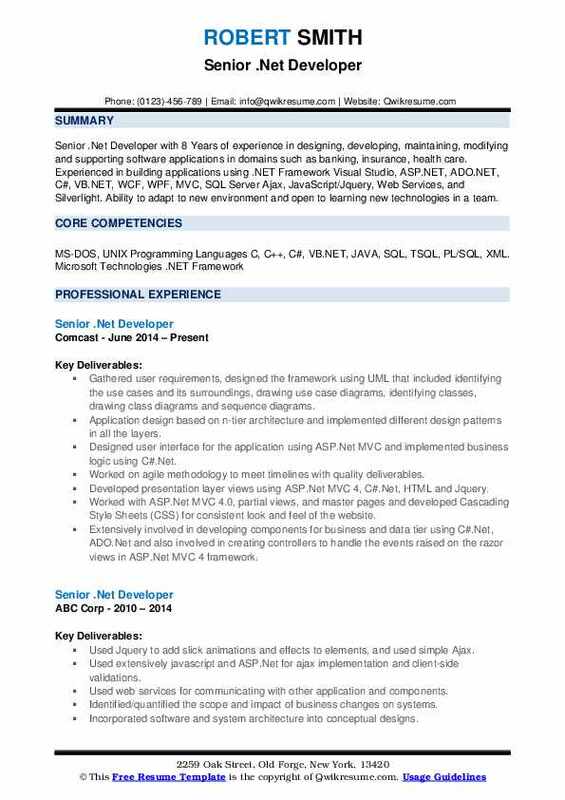 Candidates seeking this senior level entry normally hold a Masters’ degree in the field of IT or computer science with a Microsoft certification. 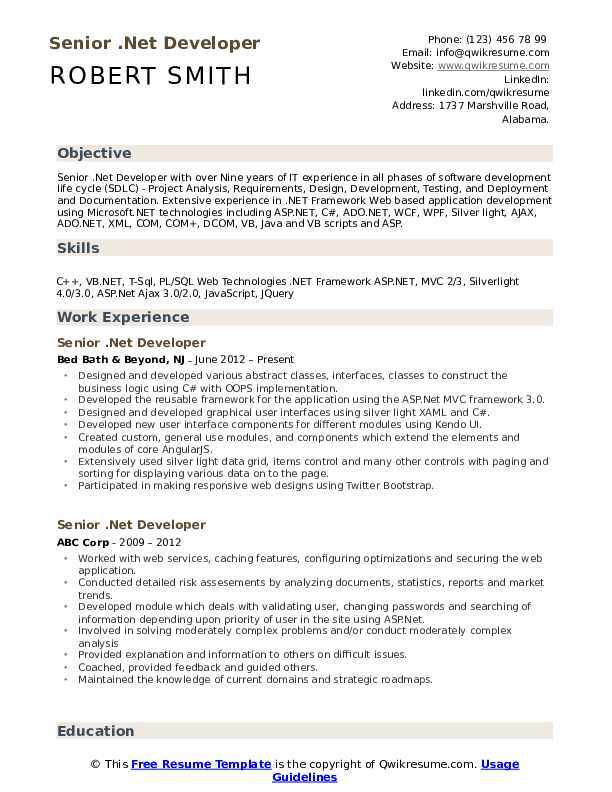 Summary : Senior .Net Developer with over Nine years of IT experience in all phases of software development life cycle (SDLC) - Project Analysis, Requirements, Design, Development, Testing, and Deployment and Documentation. 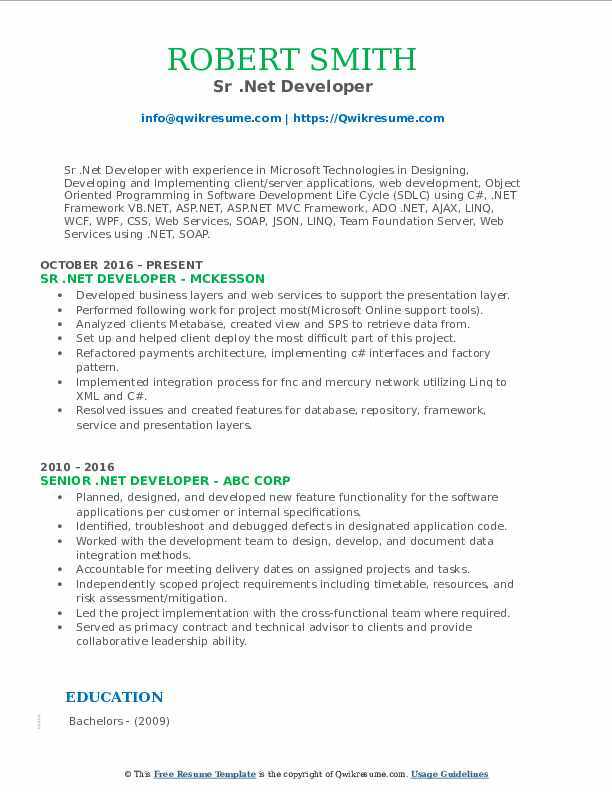 Extensive experience in .NET Framework Web based application development using Microsoft.NET technologies including ASP.NET, C#, ADO.NET, WCF, WPF, Silver light, AJAX, ADO.NET, XML, COM, COM+, DCOM, VB, Java and VB scripts and ASP. Designed and developed various abstract classes, interfaces, classes to construct the business logic using C# with OOPS implementation. Developed the reusable framework for the application using the ASP.Net MVC framework 3.0. Designed and developed graphical user interfaces using silver light XAML and C#. Developed new user interface components for different modules using Kendo UI. Created custom, general use modules, and components which extend the elements and modules of core AngularJS. Extensively used silver light data grid, items control and many other controls with paging and sorting for displaying various data on to the page. Participated in making responsive web designs using Twitter Bootstrap. 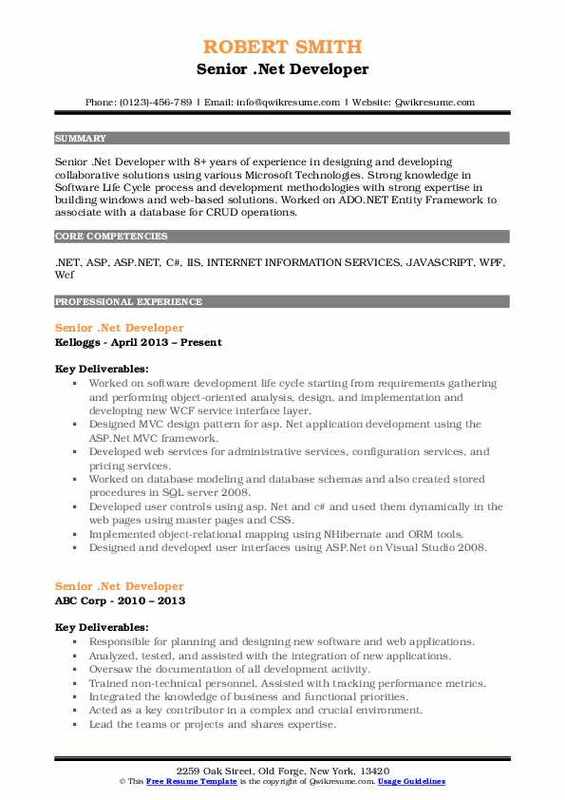 Involved in developing web pages with rich UI, Ajax, Jquery using ASP.Net. Gathered user requirements, designed the framework using UML that included identifying the use cases and its surroundings, drawing use case diagrams, identifying classes, drawing class diagrams and sequence diagrams. Application design based on n-tier architecture and implemented different design patterns in all the layers. Designed user interface for the application using ASP.Net MVC and implemented business logic using C#.Net. Developed presentation layer views using ASP.Net MVC 4, C#.Net, HTML and Jquery. Worked with ASP.Net MVC 4.0, partial views, and master pages and developed Cascading Style Sheets (CSS) for consistent look and feel of the website. Extensively involved in developing components for business and data tier using C#.Net, ADO.Net and also involved in creating controllers to handle the events raised on the razor views in ASP.Net MVC 4 framework. Summary : Sr .Net Developer with experience in Microsoft Technologies in Designing, Developing and Implementing client/server applications, web development, Object Oriented Programming in Software Development Life Cycle (SDLC) using C#, .NET Framework. Designing and developing websites on ASP.Net framework through agile development methodology. Designed and developed restful APIs and web services for clients with Microsoft web API framework. Created extensive unit, integration and regression tests in a test driven development environment. Developed service agents for WCF services to be used by WCF clients to abstract WCF client channel programming. Implementing object-oriented design patterns MVC or MVVM as suited for the projects in the solution. Built descriptive help documentation for the API libraries with example objects. Used Asp.Net validation controls for client-side validation of server controls. Involved in developing required classes and interfaces using C#.Net. Developed web applications to consume, monitor and test API methods using Jquery libraries. Developed an entity framework model and made Linq queries to connect to the database. Documented functional and technical design specifications for business scenarios involving complex business workflow. Involved in development of Allegro extensions and in providing production support to allegro users. Engaged to help in upgrading c&i business system, oxy direct enhancements, and troubleshooting of Oemis data warehouse web page. Created views, view panes, view criteria, view sets, view indexes and view columns in allegro. Created document formats in document parameters for SSRS reports in allegro. Created SSRS reports and shared databases to create accounting reports like purchase order and invoice. Created data tables, data columns, data views and data constraints in allegro. Wrote message classes and message events for trade monitoring in Allegro. Wrote a class event to download ice prices and import prices to allegro by using price API from global view API and carry-forward price. Wrote a class event, database view and stored procedure to export data to the OXYs custom AP system. 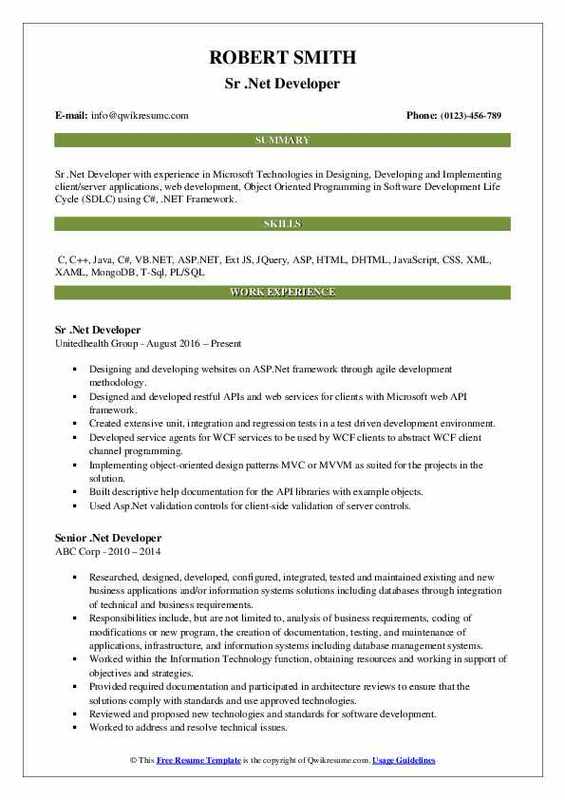 Summary : Sr .Net Developer with over 7+ years of experience in all the phases of SDLC, working through Analysis, Design, Development, Testing, Maintenance, and Documentation of Enterprise-level web and windows applications using Microsoft Technologies. .Net professional with above 7 years of extensive experience developing applications using a Microsoft.Net framework, C#, ASP.Net, ADO.Net, MS-SQL Server Web Services, Win Forms and Reporting Services. Involved in all the phases of Software Development Life Cycle (SDLC) including analysis, design, programming, testing, and deployment. Designed and developed an application using Angularjs, HTML5, CSS3, SQL server 2014 and ASP.Net web API. Created the application in .Net framework 4.5 and implement logic using C# and oops concepts. Used Angular-JS and typescript for control validations and data format checking. Developed form validations on the server side and client side using AngularJS. Developing multiple new applications from scratch and supporting multiple existing applications. Participated in scrum/agile meetings to update the status of application development. Created a database schema, er diagrams, tables, views, triggers, functions and stored procedures. Worked in designing and configuration of the Azure environment. Migrated legacy applications to the Azure cloud platform. Summary : Senior .Net Developer with 7+ experiences in the area of analysis, design, Development, testing and implement high-quality software applications. 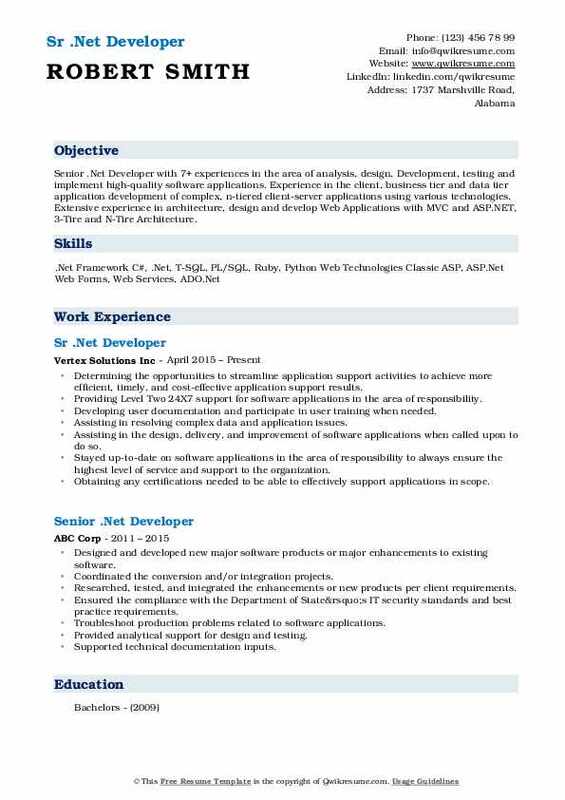 Experience in the client, business tier and data tier application development of complex, n-tiered client-server applications using various technologies. Extensive experience in architecture, design and develop Web Applications with MVC and ASP.NET, 3-Tire and N-Tire Architecture. Determining the opportunities to streamline application support activities to achieve more efficient, timely, and cost-effective application support results. Providing Level Two 24X7 support for software applications in the area of responsibility. Developing user documentation and participate in user training when needed. Assisting in resolving complex data and application issues. Assisting in the design, delivery, and improvement of software applications when called upon to do so. Stayed up-to-date on software applications in the area of responsibility to always ensure the highest level of service and support to the organization. 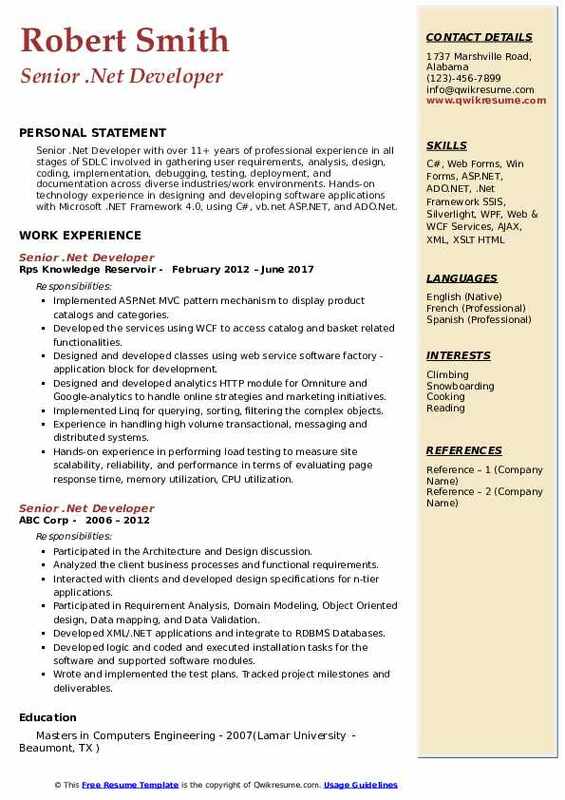 Obtaining any certifications needed to be able to effectively support applications in scope. Mentoring the peers to help them build capabilities. Documenting the troubleshooting instructions (continuous improvement). Improving the efficiency of the team to resolve problems. 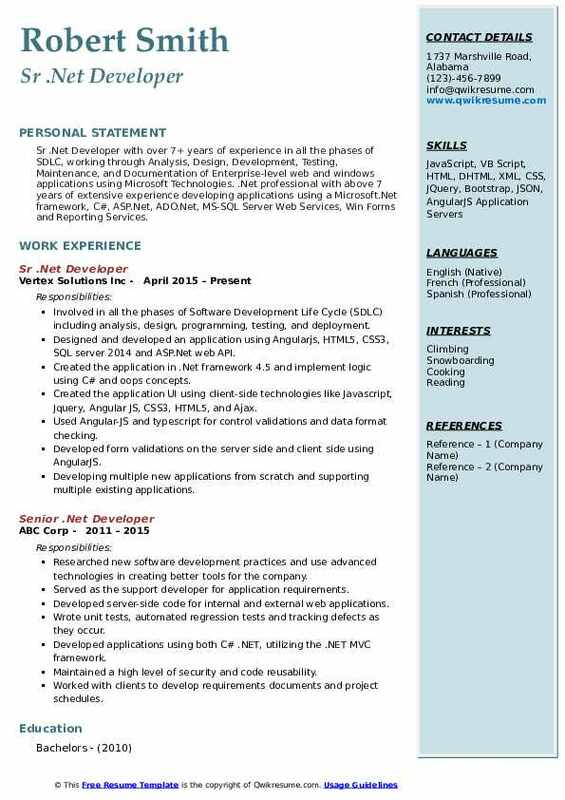 Summary : Sr .Net Developer with experience in Microsoft Technologies in Designing, Developing and Implementing client/server applications, web development, Object Oriented Programming in Software Development Life Cycle (SDLC) using C#, .NET Framework VB.NET, ASP.NET, ASP.NET MVC Framework, ADO .NET, AJAX, LINQ, WCF, WPF, CSS, Web Services, SOAP, JSON, LINQ, Team Foundation Server, Web Services using .NET, SOAP. Developed business layers and web services to support the presentation layer. Performed following work for project most(Microsoft Online support tools). Analyzed clients Metabase, created view and SPS to retrieve data from. Set up and helped client deploy the most difficult part of this project. Refactored payments architecture, implementing c# interfaces and factory pattern. Implemented integration process for fnc and mercury network utilizing Linq to XML and C#. Resolved issues and created features for database, repository, framework, service and presentation layers. Contributed to full-stack implementation of wizard-style valuations portal batch order update functionality. Involved in enhancing the application for clients requirement based on the market demand. Involved in the meeting with the users to understand and share the ideas. Summary : Senior .Net Developer with 8+ years of experience in designing and developing collaborative solutions using various Microsoft Technologies. Strong knowledge in Software Life Cycle process and development methodologies with strong expertise in building windows and web-based solutions. Worked on ADO.NET Entity Framework to associate with a database for CRUD operations. Worked on software development life cycle starting from requirements gathering and performing object-oriented analysis, design, and implementation and developing new WCF service interface layer. Designed MVC design pattern for asp. Net application development using the ASP.Net MVC framework. Developed web services for administrative services, configuration services, and pricing services. Worked on database modeling and database schemas and also created stored procedures in SQL server 2008. Developed user controls using asp. Net and c# and used them dynamically in the web pages using master pages and CSS. Implemented object-relational mapping using NHibernate and ORM tools. Designed and developed user interfaces using ASP.Net on Visual Studio 2008. Developed MMPS application on MVC pattern and possess strong experience in developing web applications. Developed SOA WCF service to communicate with the hardware encryption device. Used n-tier architecture for the business, data access layer and UI layer. 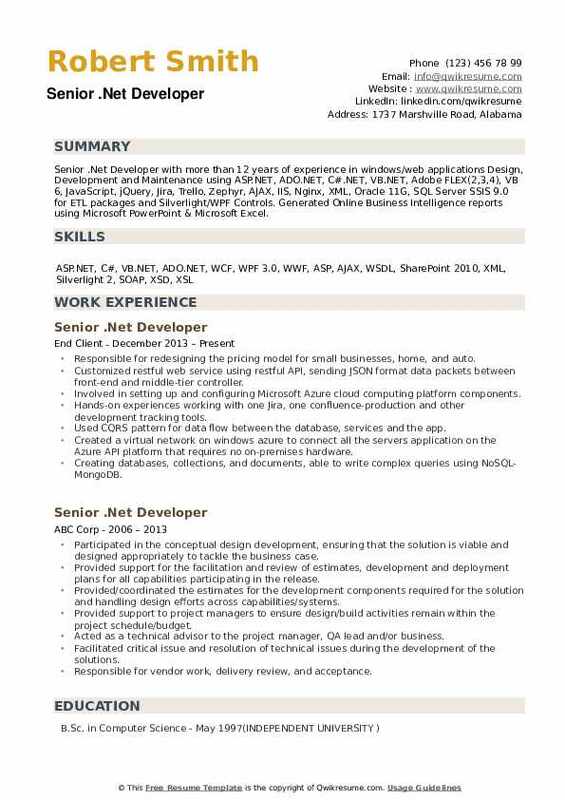 Summary : Senior .Net Developer with over 11+ years of professional experience in all stages of SDLC involved in gathering user requirements, analysis, design, coding, implementation, debugging, testing, deployment, and documentation across diverse industries/work environments. Hands-on technology experience in designing and developing software applications with Microsoft .NET Framework 4.0, using C#, vb.net ASP.NET, and ADO.Net. Implemented ASP.Net MVC pattern mechanism to display product catalogs and categories. Developed the services using WCF to access catalog and basket related functionalities. Designed and developed classes using web service software factory - application block for development. Designed and developed analytics HTTP module for Omniture and Google-analytics to handle online strategies and marketing initiatives. Experience in handling high volume transactional, messaging and distributed systems. Hands-on experience in performing load testing to measure site scalability, reliability, and performance in terms of evaluating page response time, memory utilization, CPU utilization. Created modules in Angularjs for maps, charts, and real-time scenarios. Responsible for redesigning the pricing model for small businesses, home, and auto. Customized restful web service using restful API, sending JSON format data packets between front-end and middle-tier controller. Involved in setting up and configuring Microsoft Azure cloud computing platform components. Hands-on experiences working with one Jira, one confluence-production and other development tracking tools. Used CQRS pattern for data flow between the database, services and the app. Created a virtual network on windows azure to connect all the servers application on the Azure API platform that requires no on-premises hardware. Creating databases, collections, and documents, able to write complex queries using NoSQL-MongoDB.